See in the first post in this thread (http://forums.getpaint.net/index.php?/topic/18811-ed-harvey-effects-v-35/) where it says "complete list of effects"? Have you any of those effects in your menus? (hint: the bold entries are the menu to look in). Those effects are now built in to Paint.net. Try downloading the plugin pack again if you can't find it on your computer. The link provided in that thread entitled "Additional Help" is our own BoltBait's brilliant guide to plugin installation. Thanks for the effects. Love the results of the soft hue and saturation. Downloaded the zip file but when I try to open it, it won't open. I've used two types of zip file openers and they've no problem with anything else. Just yours. Suggestions? Dump the downloaded Zip and try again. It sounds like it is corrupted. This sometimes happens in the download process. Nice new plugins Ed. Thanks very much. Great! Thank you very much Ed. I already see myself using the hexagon pixelation. One question: What's the pdb file for? I haven't seen it in your previous releases, there is no previous version in my effects folder and I can find no mention of it in this thread. The pdb file provides debug information if the plugin crashes. How do u keep the color using the halftone effect without going to black & white? Never mind. Just overlay over the original. Hello man, and thank you for this pack. Please answer, why i coudn't see icons of plugin in PDN? Not everywhere but for example in the column "Color" "The Mirror", in columnStylize-seismograph, even where ... Just not yet done, although they do not needmuch! Where can I find the hue and density for standard color filters? 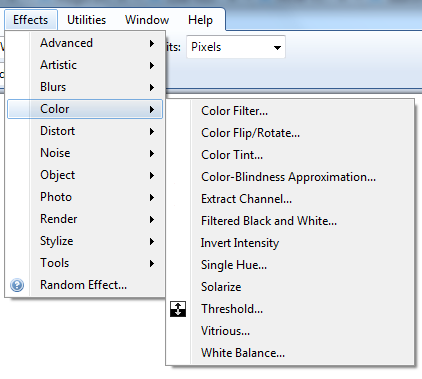 For example, if I want to simulate the use of a red 25 filter, how would I set the filter settings in this plugin? It's usually best to just play with the settings until you get the desired result. If you have other specific filters for which you require settings, I probably have that info archived away somewhere at home. Thank you very much for your prompt response, and for the plug-in itself. I'm a beginner and had been playing with the settings, the problem I run into as a beginner is I don't always know what result I'm looking for until I see it (which also means I have no idea what other filters may be of interest to me). Your explanation of the variables makes complete sense to me, I just wanted to make sure there wasn't a more scientific approach that may streamline my approach. I'll just keep learning by doing! I am new here and have looked through a lot of help topics and find nothing on where to put a .PDB file or even what it is? @ jonkiser,scroll back up this page to null54's post and you will get your answer. Does the zip file contain dll files? I extracted the zip file and it only contains a pdb file? Also, don't know if it's because of it being just two files or if it's supposed to be like this, but should the effects have no icon next to them or is that only for me? Attached file is a screenshot showing some effects without icons. To quote Null54 here "The pdb file provides debug information if the plugin crashes"